JAMAM, South Sudan, Mar 28 2012 (IPS) - Hamid Yussef Bashir said he walked for 17 days with his wife and five children to get to a refugee camp in South Sudan. 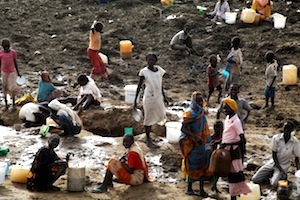 Here in Jamam, they joined about 37,000 other people who fled from the war across the border in Sudan’s Blue Nile state. Conditions in the camp are not ideal, he said. There is a shortage of clean water and his family will have to move their makeshift shelter before the rains arrive and flood their camping spot. But they were lucky to survive the journey here. While Academy Award winning actor George Clooney’s visit to war-torn Southern Kordofan has made headlines around the world, aid agencies are struggling to respond to the conflict in Blue Nile, which has sent four times as many refugees across the border into South Sudan. The United Nations says there are about 82,500 Blue Nile refugees in camps in Upper Nile, while some 20,000 have fled Southern Kordofan into South Sudan’s Unity state. The U.N. and the United States government have warned that hundreds of thousands more could flee as food runs out in both states where Sudan is fighting an insurgency. Sudan’s government is waging war against insurgents in both states, but refugees and human rights groups say Sudan is also targeting civilians in an aerial bombing campaign. Last week, the British and U.S. governments issued statements demanding Sudan stop bombing civilians, and urging South Sudan’s government to cease providing military support to the insurgents. The rebel Sudan Peoples Liberation Movement-North (SPLM-N) was formerly part of the force that fought a two-decade civil war against Sudan, which resulted in the south’s secession. After independence on Jul. 9 last year, the movement officially split and South Sudan’s politicians have repeatedly denied any ties with the SPLM-N.
Andrew Omale, an emergency coordinator with the aid agency Oxfam International, said more are expected as food runs out in Blue Nile, which lies south east of Khartoum and borders Ethiopia. Aid agencies are rushing to prepare the camp before the onslaught of the rainy season within the next few weeks. Oxfam International is urging donors to provide funds before that, as it will cost three times as much to move food and other supplies into the area once the rainy season begins and road access becomes difficult or even impossible in some areas. The rains will also flood the area where most of the refugees are camping, and agencies say they need to move them to higher ground. Clooney recently visited Yida camp in Unity state, and crossed the border into Southern Kordofan where he spoke to victims of the conflict. He has since done a raft of interviews with U.S. media, met with President Barack Obama, and testified before the Senate Foreign Relations Committee. The conflict in Blue Nile has received considerably less attention. “This area here is a very difficult area to access, and probably that’s why the international community is not focusing attention here,” said Omale. Entisar Abas el-Mak, who arrived two months ago, was waiting outside the MSF clinic with her baby. “Since I came here my child has been sick with diarrhoea and vomiting four times now,” she said. Kirrily de Polnay, a doctor with MSF, said a shortage of clean water in the camp is resulting in cases of severe dehydration and diarrhoea, along with skin and eye infections, which accompany poor sanitation conditions. Hy Shelow, the U.N. refugee agency’s assistant representative for protection, said the water table is so deep in most places that drilling machines available in Upper Nile have been unable to penetrate it. He said the U.N. is bringing rigs that should be able to drill 150 metres in order to hit water. Oxfam International said it is trucking 160,000 litres a day from three existing boreholes to distribution points where refugees receive about six litres per person per day, which is the amount a person needs for basic survival. But some refugees, including Macda Doka Waka, said water ran out at the distribution point before they were able to receive any. She and dozens of other women and children were digging into the earth in a dried out watering hole in order to extract water from waist-deep pits. Waka said she fled Blue Nile two months ago, leaving her husband who is fighting in the SPLM-N. She showed reporters her “digging stick”, a mud-encrusted iron rod. Then she continued to fill her container with water scooped one cup at a time from the floor of a hole in the spongy, cracked earth. Then she went back to her pit in the spongy, cracked earth and continued filling a container with water scooped one cup at a time.